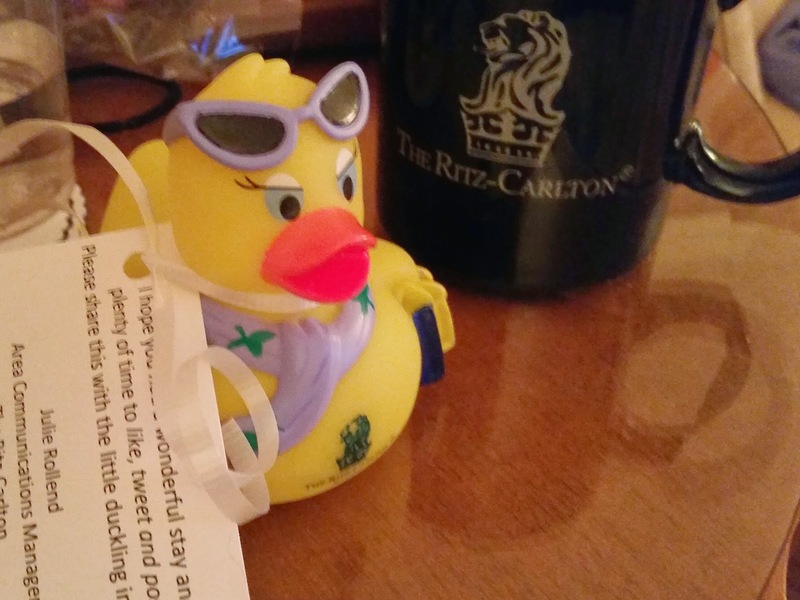 The first time I stayed at a Ritz, I was just beginning my freelance writing career, and I was a little bit more careful with my travel budget than I am now. I remember walking into the room, fearful that anything I touched would incur a room charge. I appreciated the luxury, but never felt completely at home. Fast-forward to 4 years later. Mom 2.0 was held at the lovely Ritz Carlton, Buckhead (Atlanta, GA), and I was super-excited to take my husband and new baby to enjoy the atmosphere. I was correct to be pumped about my stay; the staff was probably the MOST courteus of any place I've stayed. While I received 5-star service, it wasn't due to the upscale nature of the hotel; it was due to the high-class and kindness of the people. As far as amenities, they were what you would expect from a Ritz. The internet was surprisingly fast for a weekend when 500 bloggers were staying. The food at the restaurant was top-notch; even with the high price tag of $40+ for a waffle with fresh toppings, sausage, and pure maple syrup -- and a glass of fresh squeezed juice, as well -- we never felt like we paid for anything that we didn't get back in value and quality. With super-comfy beds, wonderful-smelling toiletries that I actually wanted to use instead of my signature Clear shampoo and conditioner, and prompt and efficient cleaning, stocking, and turn-down service, this was a stay that didn't disappoint. Ever. With all the hustle and bustle of the busy weekend, there were opportunities to unwind, as well. The well-stocked mini bar gave me a chance to enjoy a quiet drink with my husband while we took in a new movie (before it was available on DVD); we hadn't had a "date night" in awhile, so we really appreciated the time out. And where was baby during our moment? He was sleeping safely in a nice crib provided by the hotel staff. Placed by the large picture window, he took in some warm sun, slept on clean Winnie the Pooh linens, and gave us a chance to reconnect and reflect on our conference experience. If you don't already consider yourself Ritz material, think again. The diverse guest list at this location (along with their pets, in some instances) will make you feel like you fit in and deserve a flawless stay. With real, honest people working the service positions, it's easy to almost feel like part of a bigger family. (Just ask the young man who gave my husband "bow-tie" tying lessons -- offered in the lobby as part of "Bow-ties and Bourbon" Friday.) Heavy on patience and hospitality, this Ritz is the way to rest and relax in the Buckhead, GA neighborhood.